Known from two post-industrial sites within a few kilometres of each other on both sides of the Thames in South Essex and north Kent. Checklists available for western and central European countries indicate that S. distinguendus is evidently widespread, listed for France, Netherlands, Belgium, Sweden, Norway, Germany, Switzerland, Austria, Czech Republic, Hungary, Romania and Poland. However although Bonte et al. (2003) record the species as fairly common at the sites sampled at Boulonnais in northern France, they did not record it from sites sampled in Belgium and the Netherlands and also note that grey dunes are now heavily fragmented and patchily distributed within a matrix of dense dune vegetation. S. distinguendus is listed as Endangered in the Czech Republic (Buchar & Růžička, 2002) and in Flanders (Instituut voor Natuurbehoud, 2005). It has a Proposed Red List status of Endangered and Declining in Norway, as Vulnerable in Poland (Zabka, 1997), and there is only one 10km dot for the species in the Spiders of Serbia. It is also regarded as one of the most interesting species from Antwerp (Vanuytven, 1997). At the South Essex site the very localised habitat is dry sparsely vegetated ground close to seasonally wet areas on a substrate of fine almost sand-like pulverised fuel ash (PFA) and stony clinker that has a distinctly saline character. Here the spider was present in some numbers within a very small localised area. In the area immediately adjacent to where the spider has been found salt can often be seen encrusted on the surface and plants such as glasswort Salicornia grow. At the Kent site the very sparse, open grassland in which the specimen was collected has developed on a substrate of cement factory flue-ash. In terms of soil texture and possibly micro-climate this is likely to be rather similar to the PFA habitat in South Essex. 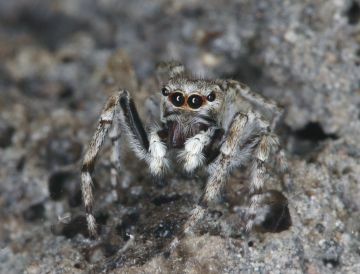 The character of the habitat where the spider has been found in Britain appears to have distinct ecological similarities to most of its recorded habitats in Europe, for example grey dune vegetation has high affinities with heathland and chalk grassland vegetation and seasonally wet habitats. In Europe the spider has also been recorded from steppes, salt marshes, sloping shrub-stony steppes, screes and cobble-gramineous stands, a bird cherry stand, stony river banks and taiga edges, larch forests and mountain steppe-semidesert, cliffs and screes and sandy places covered with sparse vegetation. UK Biodiversity Action Plan priority species. A spider with a very restricted distribution and a very small population, known from adjacent sides of the River Thames, both parts under imminent threat from development. A large proportion of the habitat on the Essex side of the Thames, which is thought to hold over 90% of the British population, is scheduled for development and the adjacent Kent habitat area is also threatened by major development proposals. There are no zoogeographical constraints on this species occurring in Britain and although the species had not been identified in this country prior to 2003, the known population of S. distinguendus is almost certainly the result of natural colonisation of suitable habitat, with the population already present for a long time. Suitable habitat may be hard to come by in this country. The dune system between Sandwich and Deal may provide some grey dune habitat comparable to northern France locations, but it is unlikely to have been widely overlooked on this or other southern dune systems. The known and potential sites are highly threatened by development in the near future. Ensure the two sites where it occurs on opposite sides of the Thames are protected from development.